In my last recipe with this rye, I choose a sweet and earthy vanilla marshmallow root syrup to balance the bitterness, but I think adding some very tart flavors works even better. There’s something about the combination of sweet, bitter, and sour, or astringent, that is so satisfying. The addition of cilantro might seem odd, but the microgreens are ultra mild and lend a gentle, fresh, herbal flavor that mellows the sharpness of the lemon juice. Add all ingredients to a cocktail shaker and shake with ice until chilled. 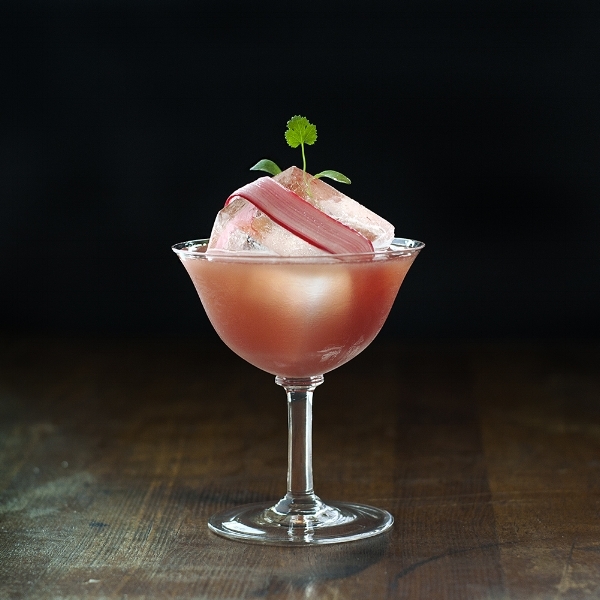 Double strain into a coupe with one large, rhubarb ribbon wrapped ice cube. Top with cilantro microgreens.